This roasted garlic, pork & aubergine pizza is the perfect combination of garlicky, meaty, salty goodness. It’s perfect for using up leftover roast pork! Oh look, another pizza recipe. 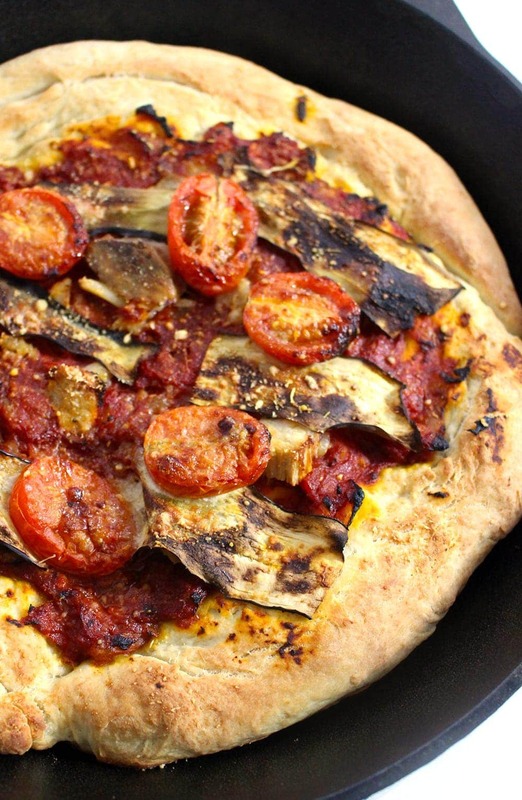 Pizza is fast becoming our favourite thing to make and this roasted garlic, pork & aubergine pizza is no exception. There is really something special about rubbing roasted garlic into the crust before adding all the sauce and toppings. It honestly takes my love of garlic to new levels. 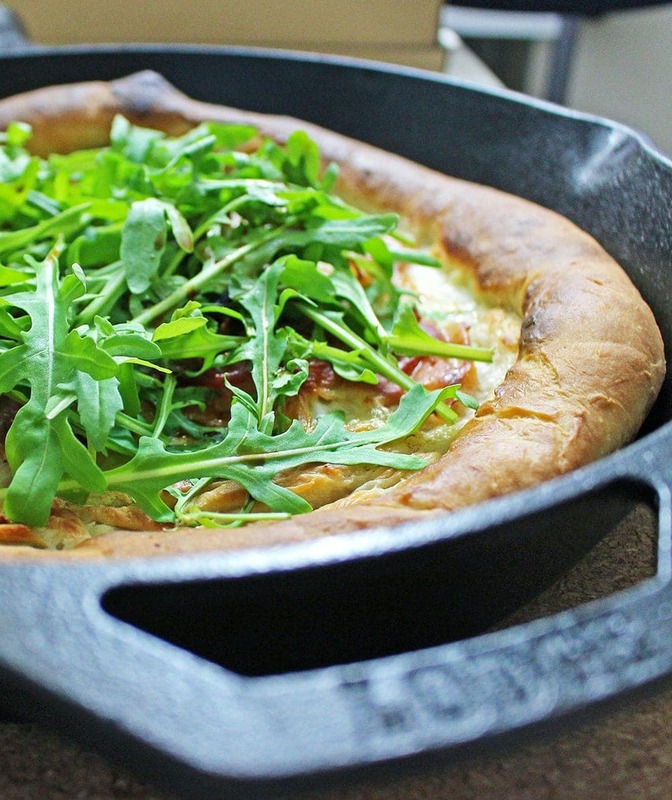 We make pizza almost once a week now and Will uses this dough recipe. He’s got super good at making pizza dough, it’s always the perfect combo of chewy and crispy and there’s always a hefty amount of crust which is the best bit of any pizza obviously. I might have to get him to guest post on here at some point just to talk about how he makes it so effing tasty. We used leftover roast pork for this pizza. You could try using pulled pork or anything else you have around. Chicken or another meat would also work, go crazy, make it your own! Just don’t miss out on that roasted garlic whatever you do. 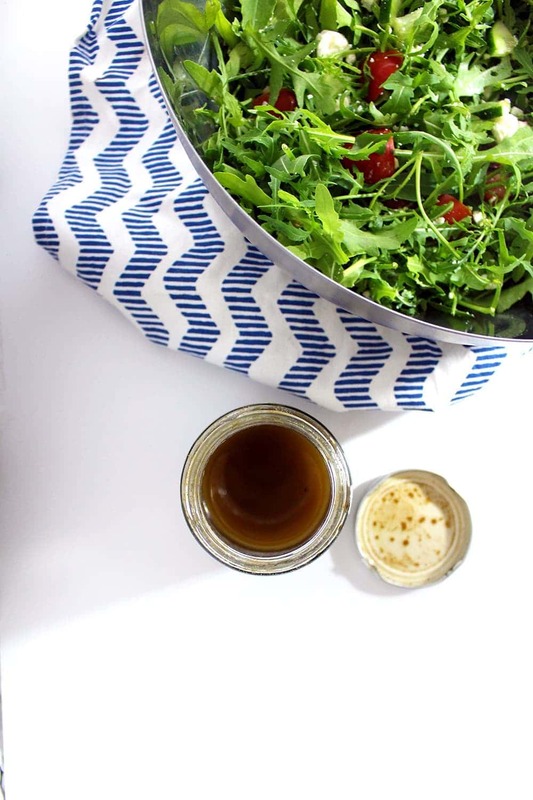 We served the pizza with a simple salad which I’ve included the recipe for along with the recipe for the easiest salad dressing in the world cus I’m generous like that! The peppery rocket and salty feta go so well with the sweetness from the roasted garlic on the pizza. Let’s just talk about the layers of tomato in this meal for a second. You’ve got the jammy tomato flavour from the sauce which is rich with a hint of spice. Then the halved cherry tomatoes scattered across the pizza before baking get roasted and turn into sweet little pockets of joy. Finally, the tomatoes in the salad deliver a much needed burst of freshness. This roasted garlic, pork & aubergine pizza is the perfect combination of garlicky, meaty, salty goodness. It's perfect for using up leftover roast pork! Mix together the water, sugar, salt and yeast in a large bowl and wait until it starts to foam a little then stir in the flour. Knead into a soft dough and then place in an oiled bowl. What you do now depends on how much time you have. For this pizza we left the dough in the fridge for the whole afternoon (about 6 hours) to rise and it turned out really well but if you don't have that much time you could leave it somewhere warm for 1-2 hours. While the dough is proving preheat the oven to 200°C, cut the top off the bulb of garlic to expose the cloves. Drizzle with olive oil and wrap in a piece of foil. Place in the oven and roast for 20-30 minutes until softened. Heat the olive oil over a medium heat. Add the onion, garlic, plenty of salt and 40ml of water. Once the water has evaporated pour in the tin of tomatoes and cook down until it's almost dry. Mix in the tomato puree, chilli powder and oregano and leave to cook a little more until it has a thick consistency. Tip out onto a plate and allow to cool. Preheat the oven to 200°C. Once the dough has doubled in size remove it from the bowl and knead for a minute. Halve the dough and roll out each piece to a big enough size to fit the skillet then gently lift one into the skillet making sure to leave a slightly thicker crust around the edge. Squeeze the roasted garlic out of the cloves and spread half across the dough with the back of a spoon. While the pizza is cooking toss the lettuce, cucumber, tomatoes and feta into a large bowl. Add the olive oil, balsamic, lemon juice and salt and pepper to an empty jar and shake together thoroughly. 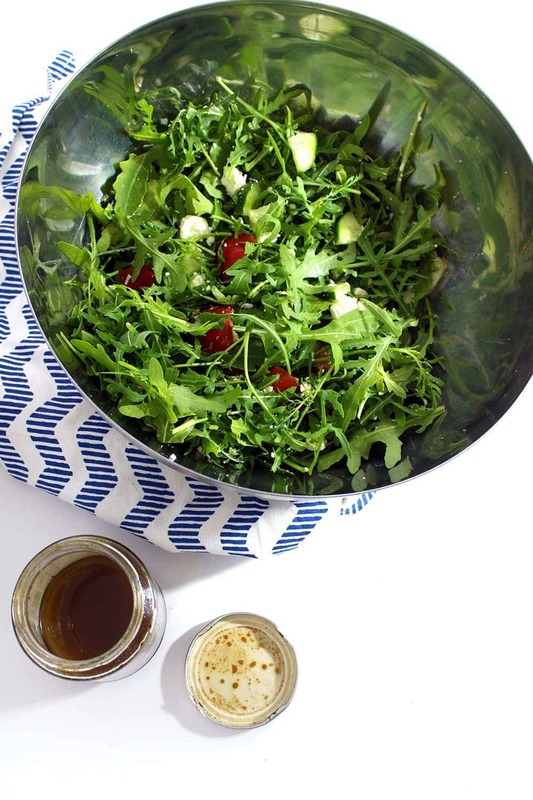 Adjust the seasoning to taste and dress the salad just before serving. 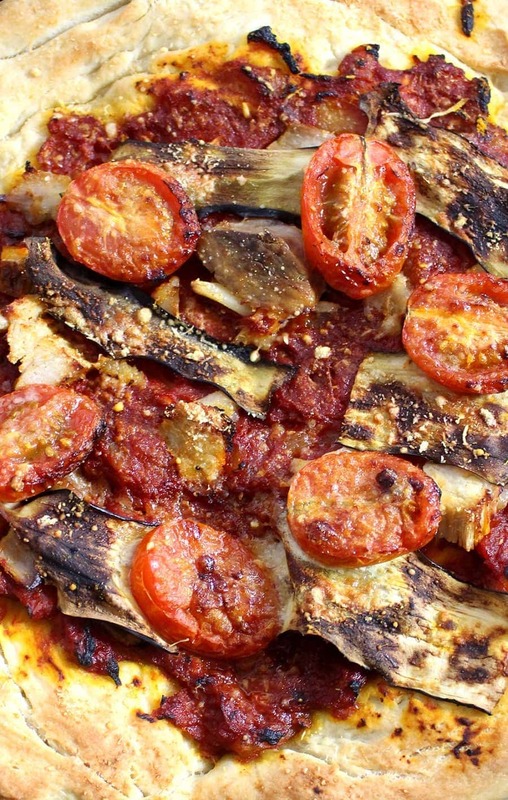 WONDERING WHAT TO DO WITH THE LEFTOVER INGREDIENTS YOU’VE GOT FROM MAKING THIS Roasted Garlic, Pork & Aubergine Pizza? 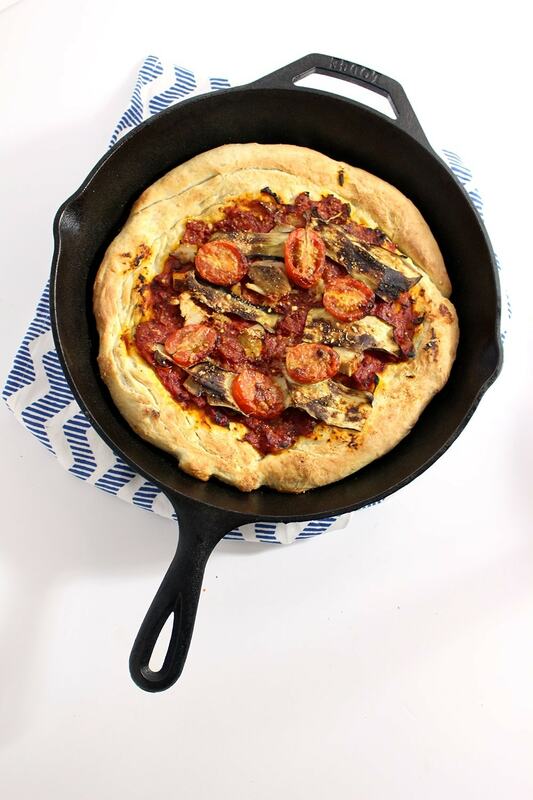 You can of course use up all the pizza dough ingredients in this other brilliant skillet pizza recipe! 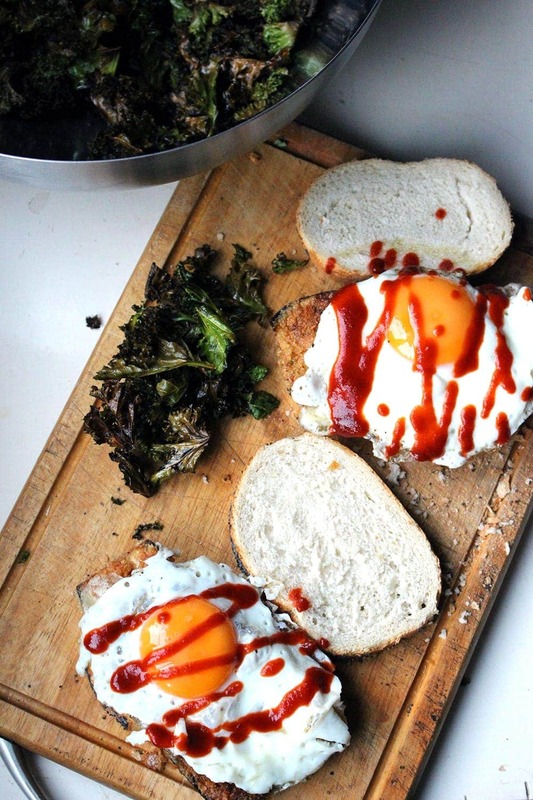 If you have any aubergine left over, use it to make these delicious panko aubergine sandwiches! I’ll take tomato on top on tomato and on the pizza any day of the week. Love the addition of eggplant too! I love my pizzas, thanks for sharing this recipe. WOW! Now this is what I call pizza! This looks fabulous!